Meet Simon the Claustrophobic Turtle. You might think that the idea of a claustrophobic turtle is funny, but to Simon it's definitely no laughing matter! 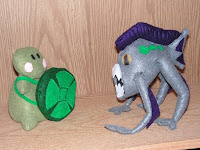 Because of his affliction, he wears his shell like a backpack instead of retreating inside of it when there's danger. So how does Simon protect himself if he never goes inside his shell? 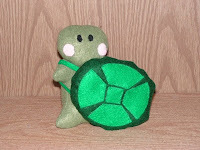 Why, he takes his shell off his back and uses it like a shield, of course! Watch out for that angry murloc, Simon!! Simon is made from felt and stands 6.5 inches tall and is 4.5 inches wide. 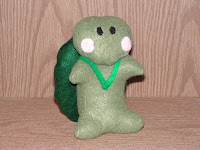 He is a special present for my little (21 year old) brother, who actually has a live pet turtle named Simon, the inspiration for this project and its name. More pics from different angles here.